Search Engines: How Do They Work? Have you ever wondered where online search results come from? Or have you wondered how you can get your site to rank well for Google or Bing search engines? It’s not a mystery – there is in fact a formula to being at the top. When you were in school you learned about the Dewey Decimal System that libraries use to catalog books. As the internet launched, information was not organized so finding what you were looking for was quite difficult. Consequently, engineers developed software that searches and catalogs the web, finding and returning web page results for a user based on inquiry keywords typed into a search field. Search engines are basically a more complex digital version of the Dewey Decimal System. Search engines are designed to provide relevant results to user queries. 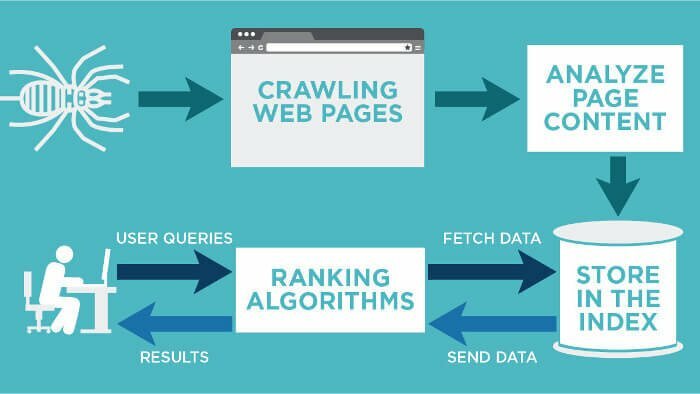 At their most basic there are three steps in the process: Crawling, Indexing and Ranking. Crawling: Automated robots, also called “bots”, “crawlers” or “spiders,” move through a site using the best path available – links. Links allow the bots to reach all the interconnected documents on the web. They literally go from link to link and collect the data. And, they return to your site again and again to look for fresh content to gather. Indexing: As bots crawl websites and correlating pages they bring back the information to their databases for storage. Once collected, the information is gathered into a Search Index, somewhat like the index in the back of a book. Bots prioritize URLs in this index and set-up automated scheduling of subsequent crawls. There are entries for almost all the words that a page or website contains which are cataloged along with lots of other data. Ranking: There are many variables that go into ranking. Google has developed an algorithm based on what they call “signals” that’s been ever-changing over the years and always secret. Same for Bing. The secrecy is intended to keep people from cheating the system, and frequently their updates to the algorithm are decidedly meant to respond to this. The outcome of the ranking algorithm is the ability of search engines to provide users with a list of results that they’ve determined are the most relevant, on a top down, page-by-page basis. Some people like Google’s results best, while others like Bing, and the difference is in their ranking signals and algorithms. Search Index placement is extremely important to your businesses bottom line, as the higher up you are in search results, the more likely a person is to click on your listing. Our team at Belgrave Associates can help you optimize your placement in search results, moving you up in rank. Ask us for a strategic consultation or full execution. Why Use Paid Facebook Advertising? Copyright © Belgrave Associates Inc. 2019. All rights reserved.